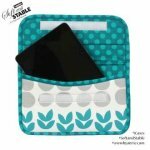 Carry an iPad, iPad mini, Kindle, or other electronic gadget comfortably with these stylish clutch cases made in your favorite fabrics and colors. Easy-to-follow instructions take you step-by-step through the process of cutting, marking, and sewing. The Small Case is perfect to hold an iPad mini*, Kindle, or other e-reader. The Large Case handily holds an iPad* or similarly sized tablet. Each case features a fold-over flap with hook and loop closure. The border on the flap is a great place to add embellishment such as embroidery. A zippered pocket on the back of each case provides convenient and safe storage for personal items. 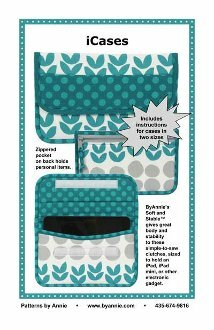 ByAnnie’s Soft and Stable™ gives the cases great body and stability and provides cushioning and padded protection for your electronic gear. *Note: Cases are designed to hold a “naked” device or device enclosed in a simple hard case. If your case is designed with a keyboard or is very substantial, check dimensions against sizes below and adjust as needed. Be sure to consider depth of device in case in addition to height and width. Small case is 6-1/4" x 9-3/4" Large case is 8-1/4" x 11-3/4"